Monday, May 12– We woke up early and went next door to the breakfast room for our morning meal. 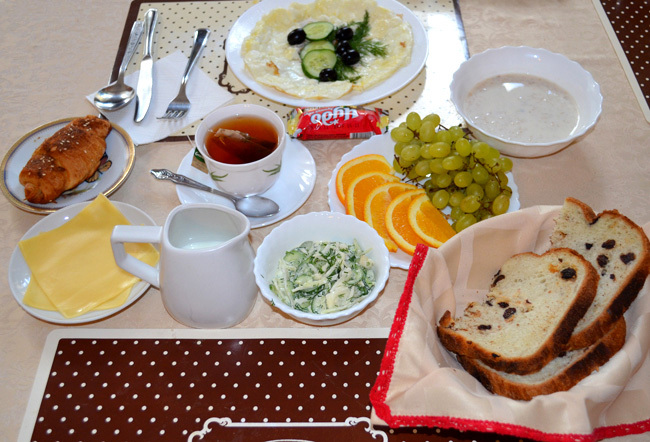 The same woman who had checked us in the night before bustled around us getting everything ready: oatmeal, fresh bread, omelet, salad, cheese….our minds were blown contemplating eating the entire breakfast. But I have to say: it was so nice to be fussed over and thoroughly fed. I realized that trying to make everything go well for my parents had exhausted me deep into my bones. I felt like, by spoiling me, the breakfast was giving me the energy I needed. Plus, I was so excited to be in Petersburg. 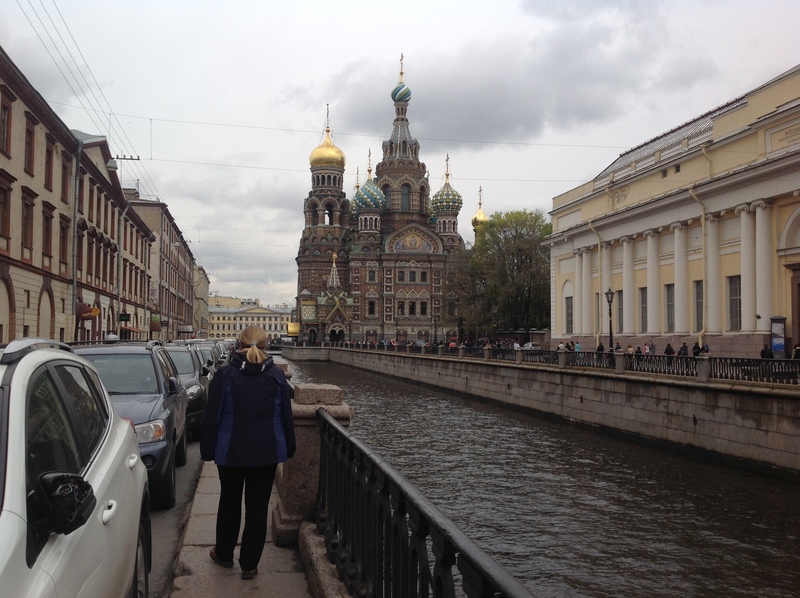 In comparison to Moscow, it’s just *easier* being in Petersburg: it’s smaller, cheaper, and has a slower pace of life. If Moscow is New York City, St. Petersburg is Washington, D.C.
After breakfast we met TATIANA, my savior and personal hero. As our private guide, she just took control of everything, making all the arrangements and all the decisions. We gleefully submitted to her recommendations, because, truly– she really did know best. So, well-fed, well-rested, and newly-relaxed, off we went! Second, notice the perspective. It’s as if the painter is raised slightly above the scene- so he’s not a participant in the meeting, he’s a journalist. This was typical of Repin’s style; he was part of an artists’ movement called the Wanderers (I’m not sure if “wanderer” is the best translation). What the Wanderers did was travel throughout Russia observing life while at the same time exhibiting their paintings so that they served as sort of “peoples’ journalists,” informing people across the gigantic country what life was like in other parts of the country. 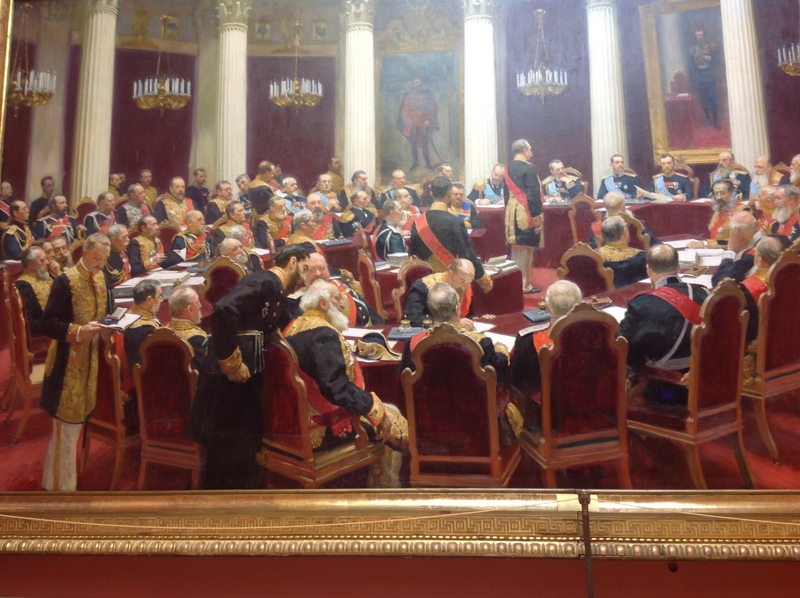 This is not a painting that would have traveled (it’s so huge), but it’s clearly in Repin’s journalistic style. 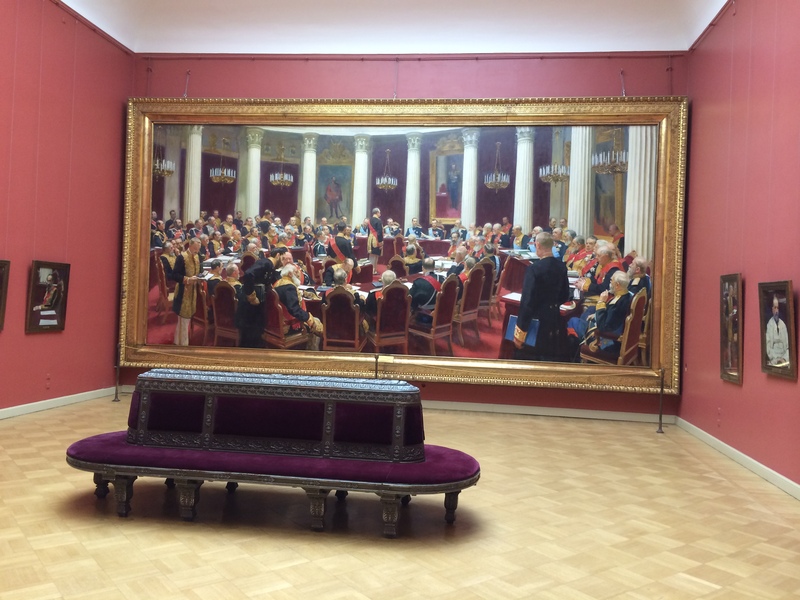 The man sitting directly underneath the mirror on the right– that’s Russia’s last czar, Nicholas II. 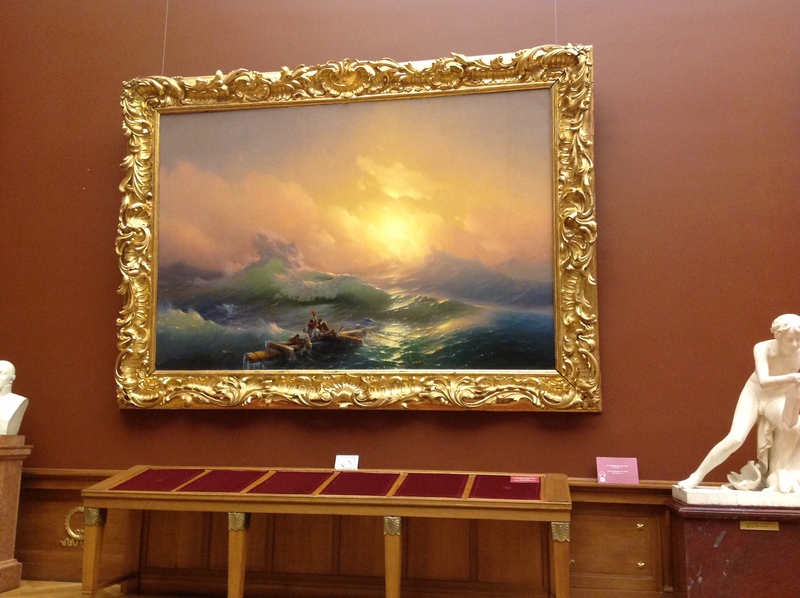 In paintings the czar is usually larger than life, but here, because of Repin’s realist style, he’s regular-sized. Repin made each person sit separately for his portrait so that he could get each person just right. Despite the fact that there are 60 people in this painting, each one is painted as an individual. Another large work, this one features people on a ship that has been torn apart by a storm. It’s scary, but the warm colors make you feel some hope for the people being tossed about on the waves. 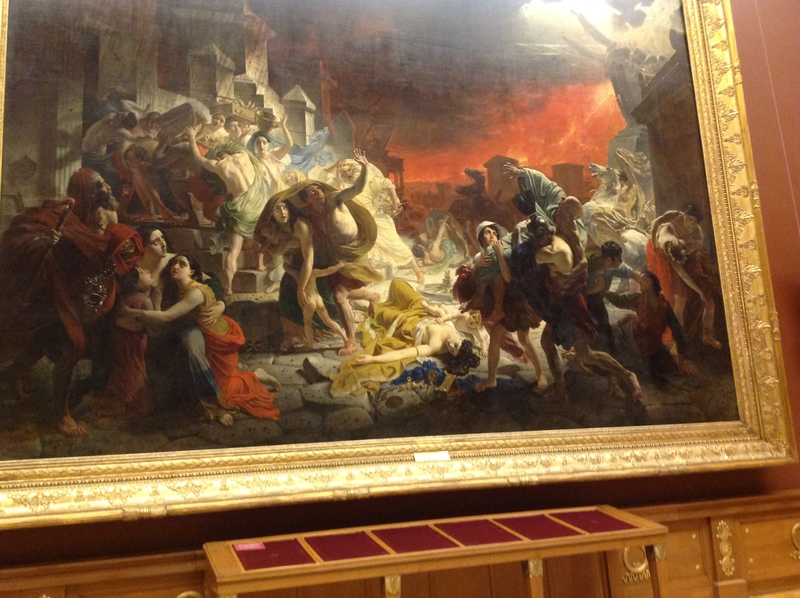 We also saw Briulov’s “Last Day of Pompeii,” a key example of Russian romanticism because of its drama, its blend of realism and idealism, nature, and love of history. You can again see how enormous it is. 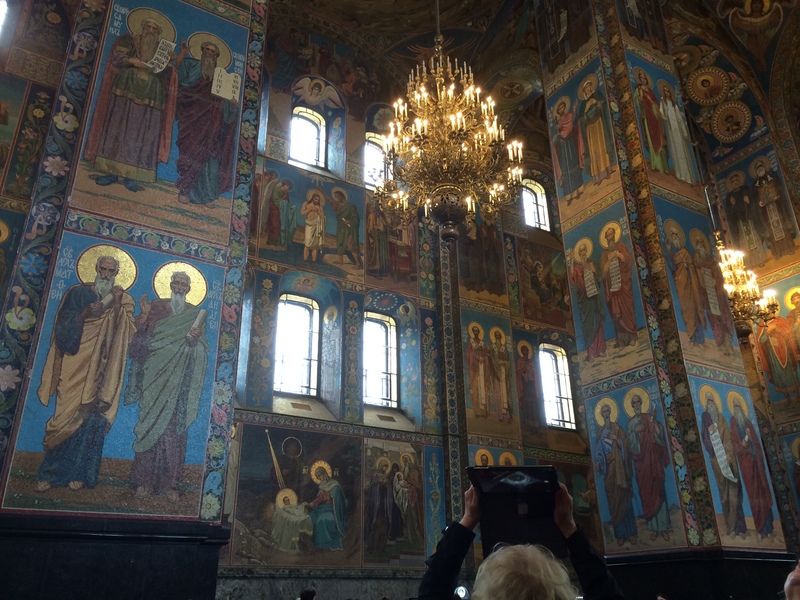 It’s called the Church on the Spilt Blood because it was built on the spot of Czar Alexander II’s assassination. Alexander II was under constant threat of assassination– he survived at least five attempts before March 1, 1881. On that day, a protestor threw a bomb at his carriage and it killed a guard, but he survived. However the plotters were really serious that day and two more bombers waited in the crowd. The second bomber was successful and blew the csar to bits. 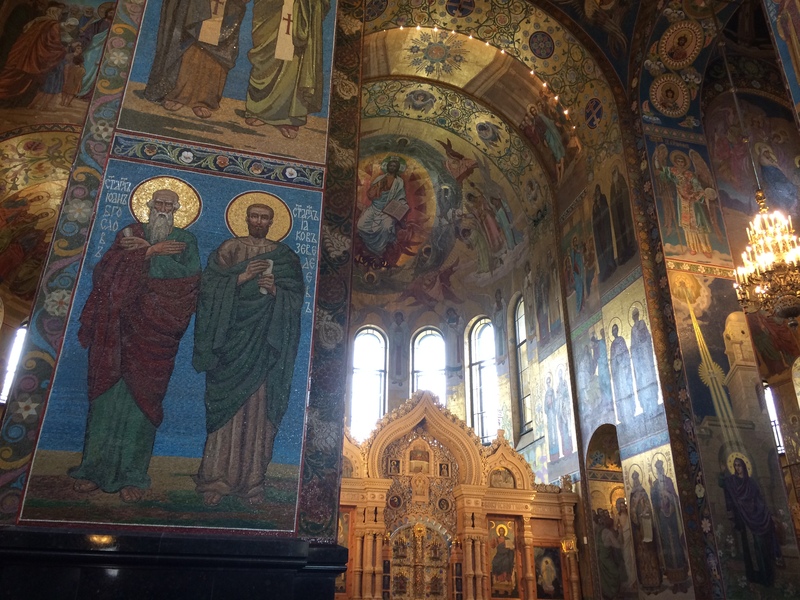 Alexander III, Alexander II’s son, decided to build a church as a memorial to his father’s murder. There were all kinds of problems during the construction of the church. The first problem was due to the fact that it was important to place the actual spot of the bombing within the walls of the church, the canal had to be narrowed: that’s why you see that one bit sticking out into the water. The second problem was that construction ran way over budget, even though it was financed almost entirely by the Royal family. The third problem was that Alexander III died young, so the project then fell to Nicholas II. Nicholas II had a bunch of other, more pressing issues (like preserving the monarchy, which was constantly under threat of revolution). Finally it was finished in 1907. We went around back and entered the church from that side. Speaking of entering, just getting inside this church is a big deal. It was under restoration for over thirty years. 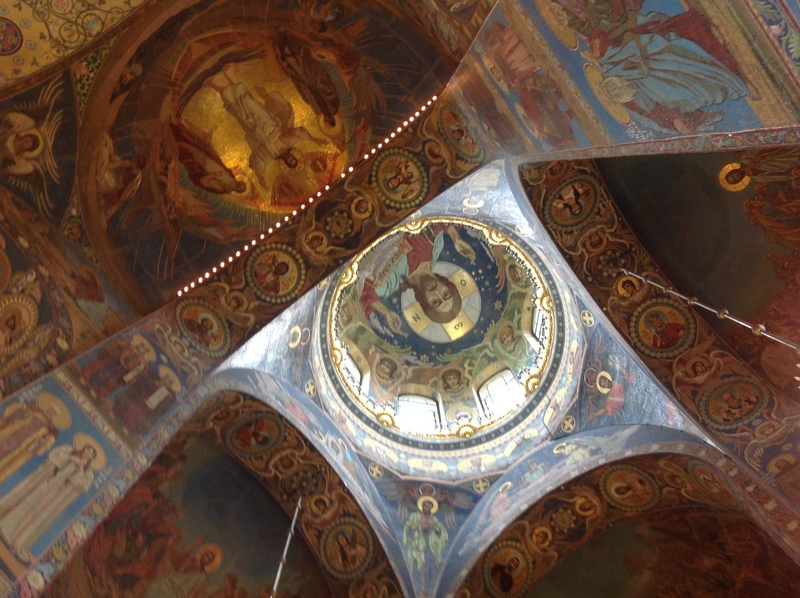 For the first seven years of my travel to Russia, not only was it not open, the gorgeous spires were covered in scaffolding. Only since 1997 has it been restored to its former glory. Also, a word about that former glory: it didn’t last long! 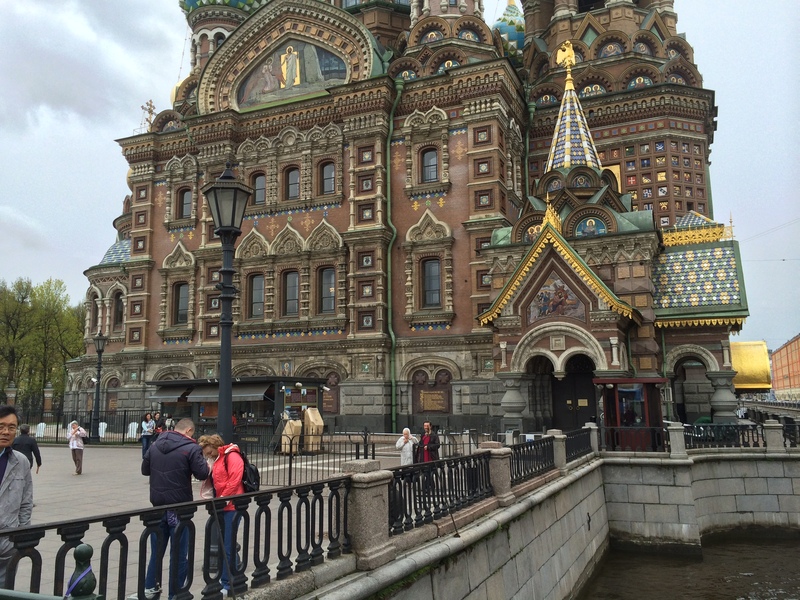 The church was completed in 1907; the Russian revolution took place just 10 years later in 1917. Because the church essentially compares Alexander II’s assassination to the crucifixion, the Soviets had a whole host of reasons to hate it. Its demolition was planned many times. On the eve of World War II, it seemed that demolition would finally happen, but the explosives experts were sent to the front. During the blockade it was used as a morgue and was also severely damaged from Nazi bombing raids. Following the war, it was used variously as a storehouse for the stage sets of a nearby theater and as a vegetable warehouse. So what you see below is what the church looked like for the ten years before the revolution; in fact, its post-restoration life has been longer: 17 years. Here’s Mom, the iPad master, taking the photo you see above. I think now it’s pretty clear why the church took about 30 years to restore. You can’t tell this because you can’t hear her voice, but Tatiana told us about all of this with the pure joy of a storyteller. She loves her city and loves sharing her city’s legends. I kind of think she was enjoying this as much as we were. According to my bathroom scales, I’m still carrying a bit of the hearty Russian breakfasts around with me. If you are hungry in Russia, it’s probably your own fault! 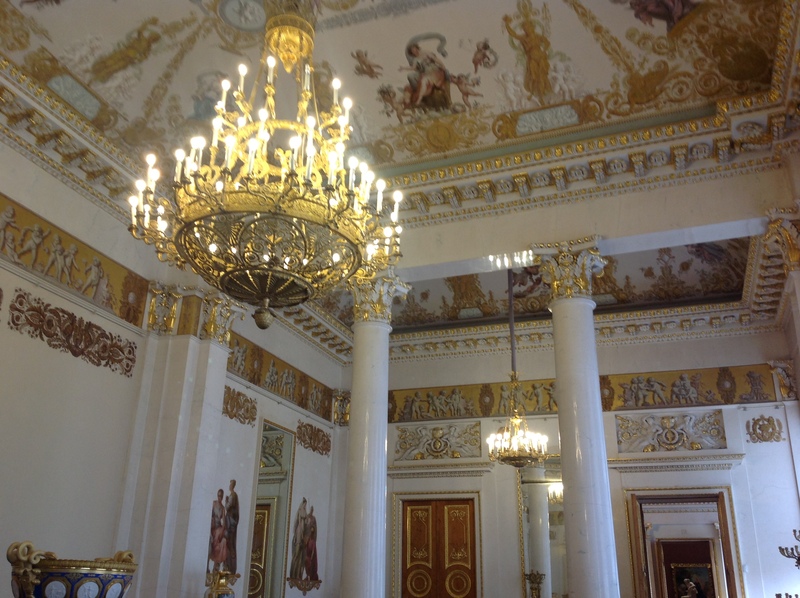 The Russian Museum is stunning. So many of the paintings were enormous in both size and scope and were exquisitely done. 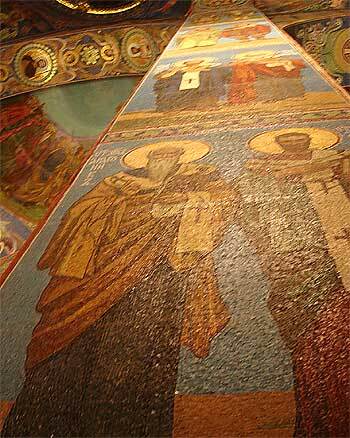 The mosaics in the Church of the Spilt Blood were incredible to see. Honestly, you had to get close to see that they were not paintings. Such meticulous work! I do believe there isn’t one square inch in that church that is not decorated. You just stand there and pivot your head, then your body all around and are awed. Tatiana could be my BFF, I love her so! She is a professional without being pedantic. She has such love for her city, and the humor and sense of our needs…..I want her to be my life coach! She also had great wisdom about topics unrelated to our touring. Yes, we gave her rave reviews on Trip Advisor. I didn’t realize it at the time, but it was much more relaxing to have Tatiana drive us around the city in her car than be anxious about getting on and off the busy subway cars.